The Thai word for river is Klong. Klong can also be used to describe a waterway or tributary leading to or from a larger body of water. 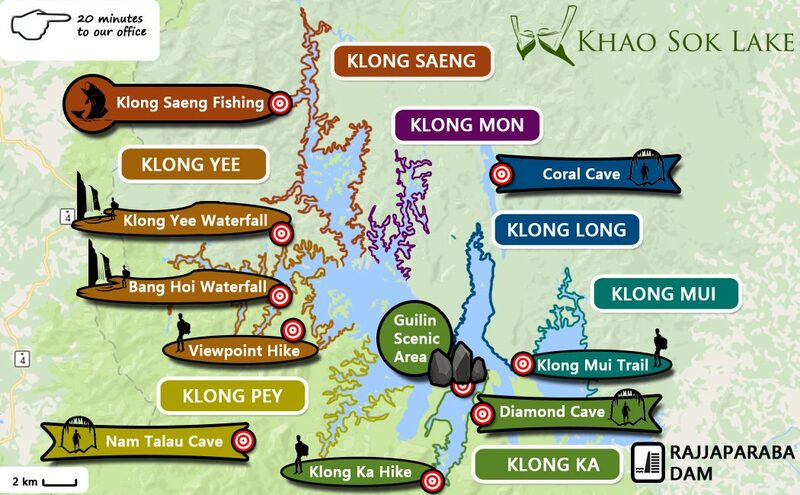 As you can see, Khao Sok National Park, Cheow Lan Lake (also known as Cheow Larn Lake), has several “klongs”. Each one has its own unique charm and opportunities for adventure. It is nearly 200 km from the Rajjaparaba Pier to Khao Sok Lake’s northwestern tributary Klong Saeng and the trip would take you over 3 hours. A private boat can take you anywhere you want to go on the lake, but we encourage you to consider what kind of experience you would like to have so that we can place you closer to what you want to see. This way we can do our part to minimize fuel consumption and give you as much time as possible to enjoy this amazing place. Caves, viewpoint hikes, wildlife sanctuaries, waterfalls and Thai trekking await you…CHOOSE YOUR ADVENTURE! Klong Ka is the closest to the pier which makes it easy to access, thus quite popular. On the way, you will pass through the world famous Gui Lin viewpoint where you can view it’s breathtaking limestone cliffs. Their scale will humble you and the spectacle makes a photo opportunity without equal. This part of the lake has two bungalows which are both run by Khao Sok National Park. Klong Ka raft house has traditional bamboo bungalows. It’s also got it’s own private island accessible in the dry season. Nang Prai is perched at the entrance to Klong Ka. Nang Prai also offers a spectacular view of the surrounding rainforest as well as individual and family bungalows. Visitors to this klong during the dry season can enjoy relaxing hikes through the flatlands surrounded by towering mountains and tall grass. Klong Beh is about 45 minutes from Rajjaparaba Pier and is home to Ton Toey floating raft house. This was the lake’s first floating ranger station and is built on some of Khao Sok’s oldest timber. Just minutes from the raft house is the trail head for the Nam Talu cave (Jan-April only) and some of the lake’s best trekking. This gigantic cavern stretches nearly a kilometer and allows you to experience nocturnal life up close and personal as you wade through waist-deep water with the help of you guide and your head lamp. If the rain prohibits hiking through the cave, or you’re not quite sure, the trekking in this area is still excellent. Many guides here will explain the rich history of this valley as a hideout for communists and foot soldiers. Klong Yee is part of the wildlife sanctuary and its jungle backwaters are rarely explored. Wild life abounds in this region of the lake and it is perfect for guided kayak tours, morning and evening nature safaris. It’s smaller neighbor, Klong Wong, is home to Krai Son , Phupa Waree, Keeree Warin, Smiley and 500 Rai raft houses. This area features abundant wildlife, peaceful surroundings, and a beautiful waterfall hike (April through December) as well as a hike to Krai Son view point. Klong Yee’s remote and secluded location make it the perfect getaway for those looking to unplug. Klong Yee lakeside camp carries a little extra expense for travel as it is so remote. When the lake is a bit lower in the dry season, this is by far the best area for lure fishing. Look out for jungle perch, mahseer, river catfish, and three types of snakehead fish. For the privilege of sharing a meal with you, the staff will happily prepare anything you can catch! Klong Saeng is the lake’s largest watershed and was Thailand’s widest river before the dam was built in 1982. It is Cheow Lan’s most remote location and takes nearly 3 hours to access by boat, but is well worth the wait. Because it is a wildlife sanctuary, special permission to enter must be obtained (and an extra fee paid) by the Khao Sok National Park upon entry. With the assistance of a park ranger, one can also hike farther back into these largely untouched jungles. Here, the disturbed habitat created by the lake returns to its natural riverine state. It is the best place to spot wild elephants and deer, and a great place to enjoy a picnic. Klong Ya lakeside camp features very basic bungalows built by the park rangers. If you are looking for remote peace and quiet, this is the place for you. The trip costs a little extra, but we feel it is totally worth it. Klong Mon is a quiet corner of the National Park Lake dominated by high hills and steep valleys. The rugged terrain and quiet atmosphere make it a great spot for birdwatching. Hornbills and Grey Eagles are easy to spot here traversing the valleys in search of food. It is also owned and run by the wildlife sanctuary as a ranger station. Klong Long is the National Park Lake´s most popular (and populated) area. This inlet is dotted with 5 floating bungalows, including Plern Prai, Sai Chon, Panvaree, and Prai Wan raft houses. Close by is a short hike and bamboo raft ride to the Coral Cave, where you can enjoy 10,000 year old rock formations. There is also an amazing viewpoint hike on the southern tip of the isthmus which takes you for a 2.5 hour hike through the deep jungle. The Gibbon calls echo through the mountains that form this narrow valley around breakfast time and make it a pleasant place to wake up.